Michel is a top scientist. He dedicated his life to "rogue waves" analysis. His book is briliant, cultural and funny. A must have "aboard" for anyone living ashore or sailing. For non french readers, (sorry for them) the book has been translated to English by Roger Taylor: "Rogue waves :anatomy of a monster" (Bloomsbury). After reading the book my perception on waves issue has changed. Annie wrote:My edition was printed in the 70s and has the appendix (as well as something about Trekka's continuing adventures). Actually - having just re-read it - I think he postulated shoals and underwater seamounts as possibilities, but concluded that it was probably just two or three waves coming together at precisely the wrong moment. In the deep Southern Ocean there is nearly always a large swell with some southerly component in it coming from the Antarctic. On top of this is the large swell from the 3 days of gale you may be experiencing. Add to that an additional swell from a perhaps lesser disturbance elsewhere and you have a recipe for 'freak' waves, which I don't think are actually that freakish. I have certainly seen some very nasty waves in this sort of conditions. They seem to build up out of nowhere, then they stand up, totter for a few moments and collapse in a heap of white water. My thoughts were generally along the lines of 'i hope one of those bloody things doesn't come anywhere near me!' I'm not talking about the vast mountain Tzu Hang encountered, but still something at least 50% bigger than the surrounding waves, which were anyway sufficiently impressive. To me the big difference between the S Ocean and the N Atlantic (apart from the size and length of the swells) is the speed and viciousness of the cold fronts. From gale force NW to gale force SW in 20 minutes. That quickly whips up a seriously nasty sea, which is a trial to most boats. Scientists at Oxford and Edinburgh Universities are now able to recreate these waves in their test tank. 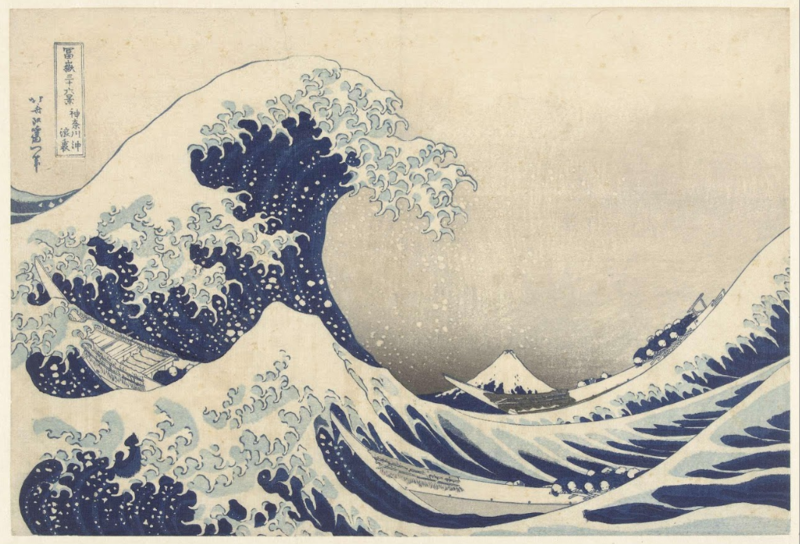 Apparently, they now understand that when two relatively small wave trains are at 120˚ to one another, the result can be uncannily similar to Hokusai's Great Wave woodprint. This was what happened to Moitessier in the Southern Ocean, as far as I understand it, when he had a SE storm following a W storm. The competitors in the GGR also suffered the same kind of thing. But it's the 120˚ angle between wave trains that seems to be the important thing, producing the largest "freaks". There's a short youtube clip that demonstrates this.